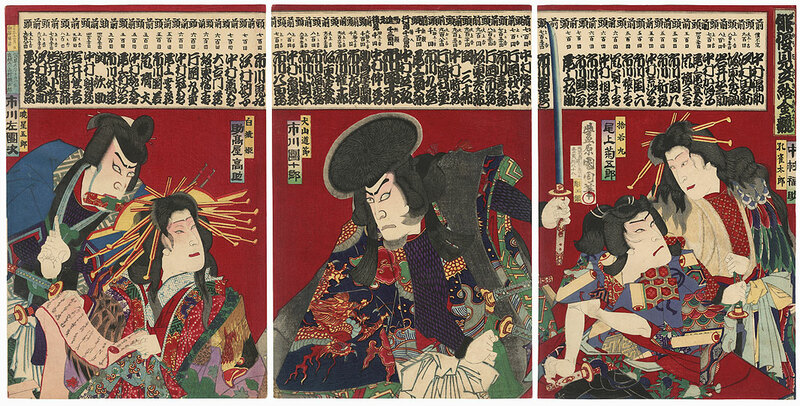 Angry Samurai and Magician, 1884 - Interesting kabuki triptych depicting a wild-haired samurai in the center waving his sword and staring angrily at the magician at left. The magician glares back at him with a scroll in his mouth, making a gesture with his hands as he casts a spell. A princess looks up beside him with a haughty smile, a long letter stretched between her hands. At right, a young boy frowns up at a young woman warrior wearing a feather patterned kimono over a furry white robe and a suit of armor. From left, the actors are Ichikawa Sadanji I, Suketakaya Takasuke IV, Ichikawa Danjuro IX, Onoe Kikugoro V, and Nakamura Fukusuke IV. 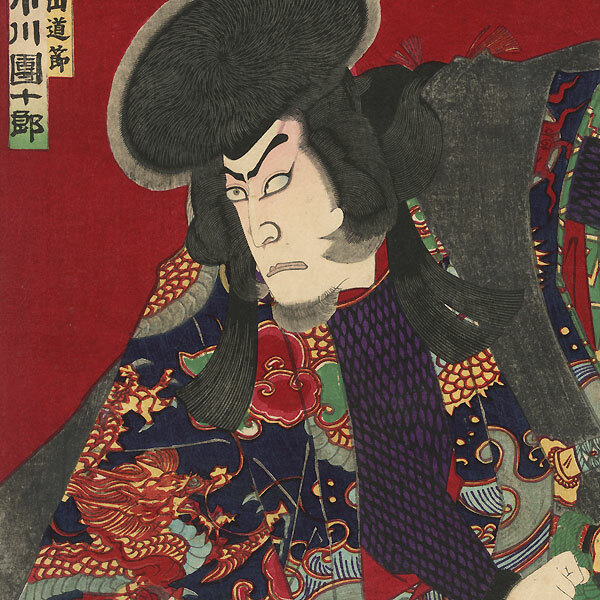 Nice expressive figures with lively color, set off by a deep red background with a banzuke or list of actors across the top. 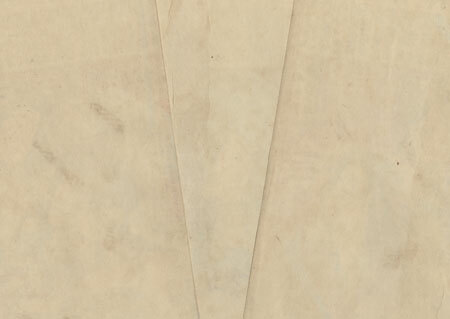 Includes embossing on the white sash in the center and a burnished pattern on the black kimono collar at far left. A handsome design. Image Size - 13 7/8" x 27 1/2"
Condition - This print with excellent color and detail as shown. Three separate panels, backed with paper. Tiny losses at two corners, repaired. Slight offsetting, very slight soiling at edges. Please see photos for details. Good overall.